(Bloomberg) -- Robert Bosch GmbH, the world’s largest auto-parts maker, is stocking up components in the U.K. LVMH, the maker of Moet & Chandon champagne and Hennessy cognac, is building up its inventory there. 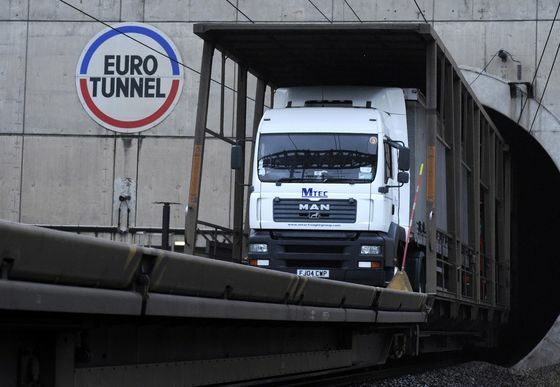 Channel tunnel operator Eurotunnel is expanding its parking lot for trucks in France. European firms that do a lot of business with the U.K. are preparing for the worst. Their frenzied activity reflects the growing likelihood that Britain will drop out of the European Union without a deal on March 29, resulting in higher import duties and border delays. That concern grew after Theresa May on Tuesday won the U.K. Parliament’s backing to go to Brussels and renegotiate her Brexit deal, an option the EU says is out of the question. "We now have to prepare for the worst case," Bosch Chief Financial Officer Stefan Asenkerschbaumer told reporters late Tuesday in Stuttgart. Chief Executive Officer Volkmar Denner added that a no-deal Brexit "would have fatal consequences." A so-called hard Brexit will cost companies in the EU and Britain 58 billion pounds ($76 billion) a year in “red tape,” or tariff and non-tariff expenses, a report by Oliver Wyman and Clifford Chance estimated in March 2018. While the EU automotive industry is likely to be hit the hardest, for the U.K. the deepest impact would be for the financial services sector, the report said. Companies across the region have been preparing for the divorce ever since the U.K. voted to leave the EU in 2016. While they’ve largely focused on an orderly exit, they are now having to dust off plans for the extreme-case scenario. Take LVMH Moët Hennessy Louis Vuitton, for example. The company said Tuesday that it has added four months of stock to its U.K. wine and spirits inventory in preparation for the country’s expected exit from the EU in March. British sales represent about 4 percent of the group’s revenue, and executives said they’re ready for the worst-case scenario. Eurotunnel, for its part, is expanding its French terminal’s parking space by three hectares so more trucks can park while they wait for customs inspections. Prefab buildings are being installed to accommodate more customs officers, before permanent ones are built. The company’s tunnel under the channel transports more than 20 million passengers, 1.6 million trucks and 2.6 million cars every year between Dover in the U.K. and Calais in France. It accounts for 25 percent of goods trade and 1.7 billion ton-kilometres of freight between the U.K. and continental Europe. While the goods sail through now, customs checks will mean long road backups. French harbors -- through which 60 percent of all goods and people moving between the U.K. and the EU go -- is adding 580 additional customs and sanitation staff. “My mandate is to make sure we are ready to face the most constraining situation,” Vincent Pourquery de Boisserin, the national coordinator for harbors, said in an interview. Banco Santander SA, the Eurozone’s largest lender, whose U.K. unit contributes 13 percent of group profits, has been hedging the pound and being prudent about its credit exposure since the 2016 referendum, Chairman Ana Botin said on Wednesday. While lenders such as Santander that focus on retail banking are less vulnerable to a disorganized Brexit than investment banks that depend on securities trading in London, they’re still in the line of fire. They could face a barrage of loan defaults from small businesses that haven’t prepared the documents needed to export and import goods. Small businesses are scrambling to squeeze in as much of their business as they can before the Brexit deadline hits to avoid higher duties. Spanish vineyards, for example, are shipping as much wine as possible ahead of a potential hard Brexit. About 350 kilometers (217 miles) north of the capital Madrid, La Rioja is the largest shipper to the U.K. among Europe’s wine-exporting regions. In the first nine months of 2018, its wineries sold 32 million liters, one third of their global exports, in the British market, according to data from the Spanish Wine Market Observatory, known as OEMV.